← New York, New York!! On June 5, 2010 my sister-in-law, Jennifer, will be getting married. Everyone is so excited and we all love her fiance, Michael. Planing a wedding, to say the least, is exhausting! It’s the kind of exhaustion that you can only understand if you have planned a wedding yourself. Hang in there, Jen. It will be here and gone before you know it! 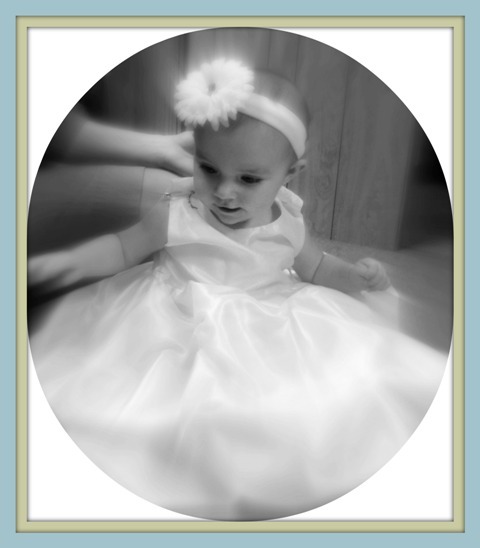 Jennifer has asked that Landrey be a Miniature Bride for her wedding. How exciting!! 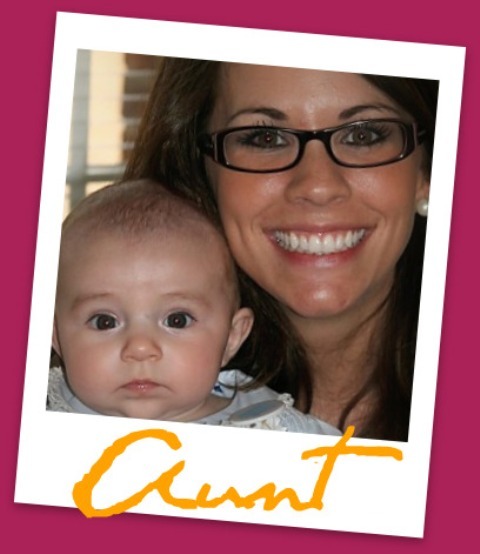 Jennifer’s other three nephews, Evan, Pierson and Ethan, will be dressed in little tuxedos and Landrey in the littlest wedding gown you’ve ever seen! I can hardly wait to see the four of them going down the aisle together. 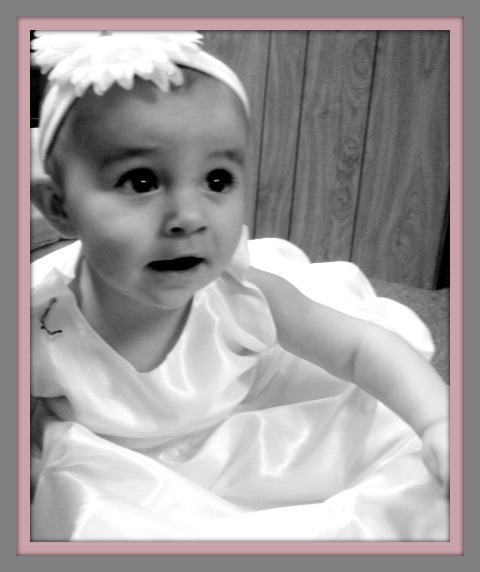 Landrey’s dress arrived and I was right- it was the littlest wedding gown I had ever seen. Just adorable! I immediately put in on her. Surprisingly, the length was perfect, but it needed just a few alterations on the straps. I had never seen anything so adorable! Off to the seamstress we went. 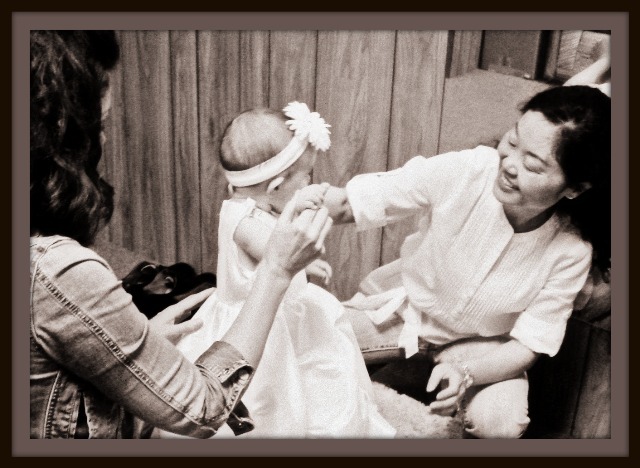 While we were there, Landrey’s Aunt Julie (aunt JuJu) was there having her bridesmaid dress altered. (By the way, I cannot wait to wear mine. They are beautiful!) 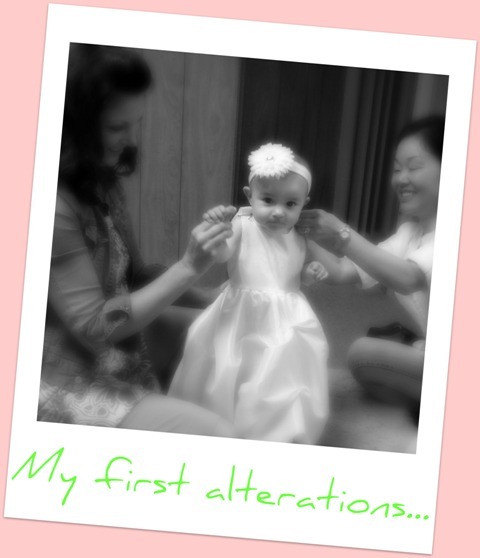 Thankfully, Julie thought about taking pictures of Landrey’s first alteration. What kind of mother am I..? 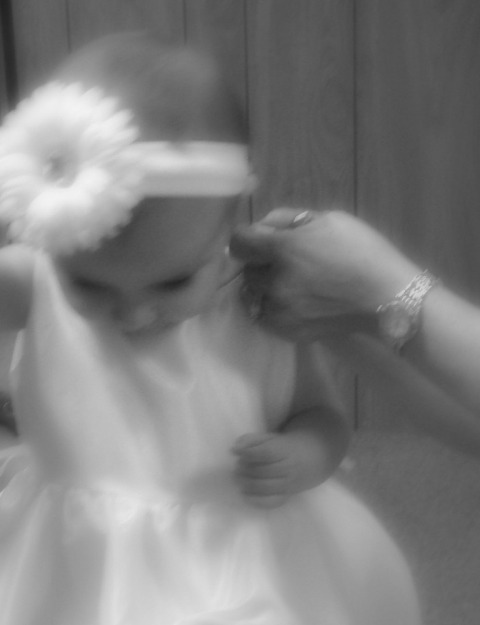 ?..forgetting to take pictures of Landrey’s very first alteration, and for a very special occasion? I did, however have my camera handy. Funny how I NEVER leave the house without it now. Mrs. Chong has for years, done alterations for the Haas family. Julie and Jennifer remember her fitting clothes for them when they were young and Jason doesn’t take any of his suits to anyone but Mrs. Chong. She has altered throughout the years, countless clothes for all of us, Julie’s wedding dress, my wedding dress, Jennifer’s wedding dress, and now Landrey’s first alteration in her little dress. Thanks Mrs. Chong, for making some of our most memorable times in our lives perfect! 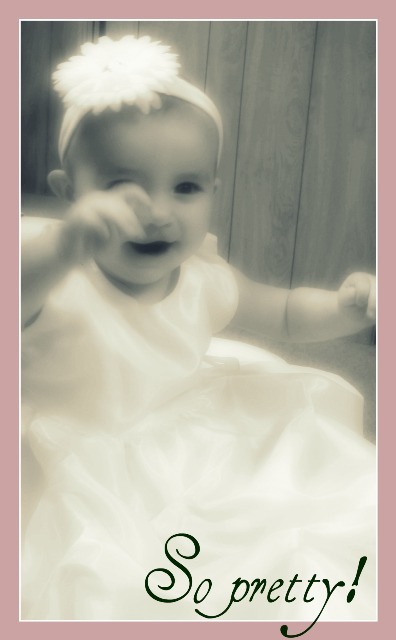 A LITTLE ANGEL…SENT FROM HEAVEN WITH A ROBE OF WHITE…THAT IS WHAT SHE LOOKS LIKE TO US!! KEEP HER LIFE ALWAYS AS PURE AS THIS MINATURE WHITE BRIDE’S GOWN THAT SHE WILL WEAR AT HER AUNT jENNIFER’S WEDDING IN TEN DAYS! MAY SHE COME TO KNOW JESUS AS AN EARLY AGE. MAY SHE LOVE HIM AND SERVE HIM AND BE A GREAT BLESSING NOT ONLY TO HER DAD AND MOM AND HER EXTENDED FAMILY, BUT TO THE HER SAVIOUR, JESUS CHRIST. AMEN.